Artists in pastel are like any other interest group, composed of members with hugely varying backgrounds, but fiercely unified in their medium. Only they appreciate the enormous variety of expression that can be attained with what seems to the uninitiated to be fairly limited means. But when you see,as I do in my blog, the great number of individuals who pursue their art with unique vision, personal style, and devotion to a theme, exploring the medium on all manner of supports, exploring the technique, inventing, creating, always learning in the never ending pursuit of perfection. And make no mistake about it, among contemporary pastellists there exist great artists, and great art. So, when a new book on pastels is published, all pastellists worthy of the name prick up their ears and want to know more. We all have a library of cherished works, containing “how-to” books and glossy “best-of” – I like both, although I think the latter may well have been superseded by the website. But for sheer hands-on practical purposes, a book is needed – for techniques, recipes for pastels and grounds, anecdotes – to slip bookmarks into and to read in bed! When Daniel E. Greene wrote his seminal book, Pastel, in 1974 it was too soon for me, but I found Alan Flattmann’s 1987 book hugely informative and influential. The Art of Pastel Painting inspired me, showed me how, amazed me with Alan’s paintings, and remains a firm, often consulted favorite. I have acquired many pastel books since, and have learned much, but nothing quite matched Flattmann’s work – until now. Ellen Eagle is in the same tradition as Flattmann – a practising artist who talks lovingly and knowledgeably about her art. Her book is for the practising artist, and as such is divided into practical chapters, covering a little history, the materials, the techniques, the genres. There is something new to be gleaned even for the most experienced. To begin with, Ellen referenced some pastellists from history that somehow I had missed, and was able to talk about rare paintings she had taken the trouble to see. After that, her main divisions, in logical sequence, are: Basic Materials; Advanced Studio Practices; A Look at the Genres; The Working Process; On my Easel; Display and Handling. The advanced artist might be tempted to skip this section – but hold! Have you thought of testing your colours for their lightfast qualities? Ellen has, in a simple but clever sunlight test. She demonstrates the effects of varying wet and dry marks – and marques – on differing supports. She explains the difference between many of the major brands that she uses; she shows how to sharpen those hard pastels to use in her smaller, exquisite portraits. And she shows how she likes to organise her pastel collection – I’m glad to say we are like-minded in this regard, we both make colour charts and like order to prevail in the studio! The important topic of toxicity is discussed adequately, without fuss. Then Ellen tests some pastels on various popular supports - an essential part of deciding how to proceed with a project. How much tooth will you need? Will you want to wet the support at any stage? What about tone? Do you want to make your own ground? Your own pastels? Ellen knows how – she paints on her own gessoed boards. Are you lucky enough to have space for a studio, or are you just putting up with a painting space that could be improved? Read Ellen’s thoughts on light, ambiance, backdrops, easels, mirrors. And above all, I urge you, keep a notebook. Use it for notes on what you do, what you used. I learned this early on, and it saved me painful repetition when painting series, even though I tend to keep a sub-set of pastels aside in those circumstances. Random thoughts rub shoulders with thoughtful analysis. The progress of a painting - or not – is recorded; it’s personal, not a literary endeavour. Just keep it legible and try not to smudge it too much with charcoal! A look at the Genres. 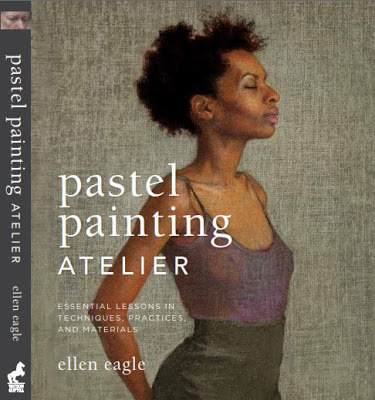 It is such a privilege to read Ellen on portrait painting. This is an artist at the height of her powers, talking about what she knows and loves best. This chapter alone justifies the book. Her patience, her stillness, her empathy – all are necessary to achieve her purpose. Read, and contemplate, and learn. Since I work mainly in still life, I was particularly interested in what Ellen had to say about this genre, and who else was featured – my absolute heroes in this genre are Jane Lund, Andrew Hemingway, and Dan Massad – Dan is featured here. Ellen considers still life to be portrait of items chosen out of the artist’s affection for them. This certainly gives them a personality and a value the artist must convey to the viewer. She may arrange objects, or find them ready and waiting, another facet that I am in sympathy with. Her own paintings in this genre are, well, unexpected! The working process is explained at length – not just the physical process but also the thought process, which is perhaps more valuable. Ellen keeps daily notes of her work, so that her diary may in form both the work in progress, and future paintings. This section also answers intellectual challenges faced by her students in the Art Students League, a clever way of expounding further on artistic problems. Finally, Ellen talks us through work in progress on her easel, a selection of six pieces, including three portraits and three still lifes. Again, both the mental and physical progress are probed and analysed with affection and intelligence. A minor complaint in this section is that the painting of the Bee Balm is shown larger than life, and while it is easier to see its development “à la loupe”, I would like to see the little 11.6 x 7.1 cm painting life size. 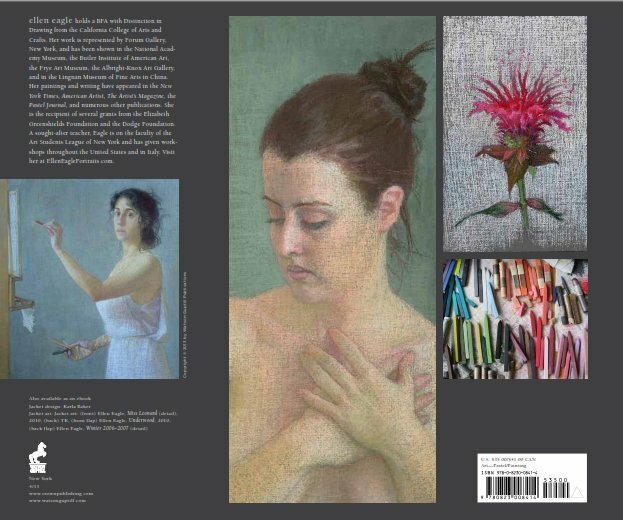 The book ends with a section on framing, display, and caring for pastels; and closes with an extensive list of museums world-wide where pastels may be seen – including some in the National Gallery in Dublin that I was unaware of! There are some small areas I might suggest could be altered in future editions. When Ellen discusses supports she refers to Canson as a paper whose tooth is rapidly filled, and this is indeed the case; but there is also Canson Mi-teintes Touch, which is a sanded paper quite different from the standard Canson, and not mentioning it might give rise to confusion for beginners. Nor does velour get a mention, although I can quite see how Ellen would have little use for it in her practice. And after all the book is not meant to be an encyclopedia of pastel. More seriously, when Ellen writes about manufacturing one’s own pastels, she suggests the wearing of latex gloves to avoid allergic reactions from the pastels. But latex is itself prone to give rise to a very unpleasant allergic response, so it might be better to suggest vinyl gloves, or some material other than latex. Apart from those minor caveats, I believe this book deserves to become a classic. It is a major addition to the literature, written by an experienced and sensitive artist and teacher. I shall return to it again and again, and slowly savour the advice, the wisdom and the art of Ellen Eagle. Fine review! I look forward to getting mine in the post! She does indeed Vanessa and it is included in my alphabetical list of artists! Since 2009.